Over at Project Mayhem Today--and GUARDIAN HERD WINNER Revealed! 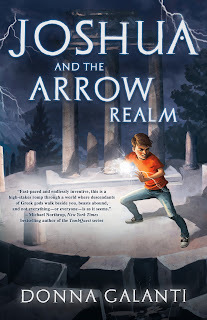 I'm over at my middle grade group blog today, PROJECT MIDDLE GRADE MAYHEM, writing about books featuring characters with ADD/ADHD. I hope you'll pop over and have a look! 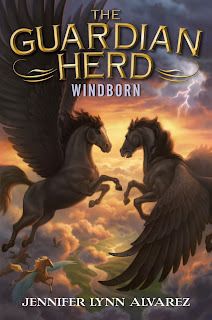 Marvelous Middle Grade Monday: Interview with Hazelwind from THE GUARDIAN HERD #4: WINDBORN. Omigosh, people! I am so excited today. In February of this year, I met Jennifer Lynn Alvarez at Green Bean Books in Portland. (She was doing a reading with the equally excellent Anne Nesbet and Kristen Kittscher.) Jennifer's the author of the amazing The Guardian Herd series, and she agreed to share with the Middle Grade Mafioso some fantastic goodies from the series. First, an interview with the popular buckskin stallion Hazelwind of Sun Herd, taking a break from the intense action in Anok to answer a few questions for us. Hazelwind's also brought a never-before-seen sketch of himself that appears in The Guardian Herd #4 WINDBORN. (This book releases online and in bookstores on 09/20/2016.) Then, there's a video. Finally, there are PRIZES!!!! Jennifer will send one lucky commenter a Guardian Herd Windborn notebook, as well as a signed book plate and some character trading cards. Isn't that amazing?! But first, I'd like to welcome Hazelwind, and thank him for joining us today at Middle Grade Mafioso. Hazelwind: Glad to be here actually. Thanks for having me. Middle Grade Mafioso: So book #3 LANDFALL ended in a huge cliffhanger. As a character in this series, what was that like for you? Hazelwind: That’s a good question. The truth is that it’s as tough for the characters as it is for the readers. The author doesn’t allow us to read ahead, so none of us had a clue who would live, who would die, or what would happen next. Actually, I think it’s worse for us than it is for the readers. They’re safe in their Landwalker homes or schools, but we’re in Anok, in a forest called the Trap. It’s anything but safe. MGM: Since you mention it, what are conditions like in the Trap? Hazelwind: It was springtime when I was there, but still cold and foggy. Day after day went by without any of us seeing the sun. The Trap is located in Northern Anok, on the tundra. The predators are huge and the food is scarce. I much preferred the chapters that took place in Sun Herd’s lands. The weather there is almost always pleasant. MGM: So if you’re no longer in the Trap, where are you? Hazelwind: Well, that’s tricky. If I tell you, then I’ll give away some stuff that happens in book four, WINDBORN, and that’ s top secret. MGM: But by now, you’ve finished the final chapters of WINDBORN, so you know how it ends, right? MGM: Can you tell readers anything that might ease their minds? Is Morningleaf alive? Does Star defeat Nightwing? Is Thundersky freed from the Beyond? Hazelwind: (nickers) It wouldn’t be top secret if I told you now, would it? But honestly, a book is a journey that must be experienced. It wouldn’t be fair to readers for me to reveal anything. MGM: All right, I tried. Now, let’s move on. 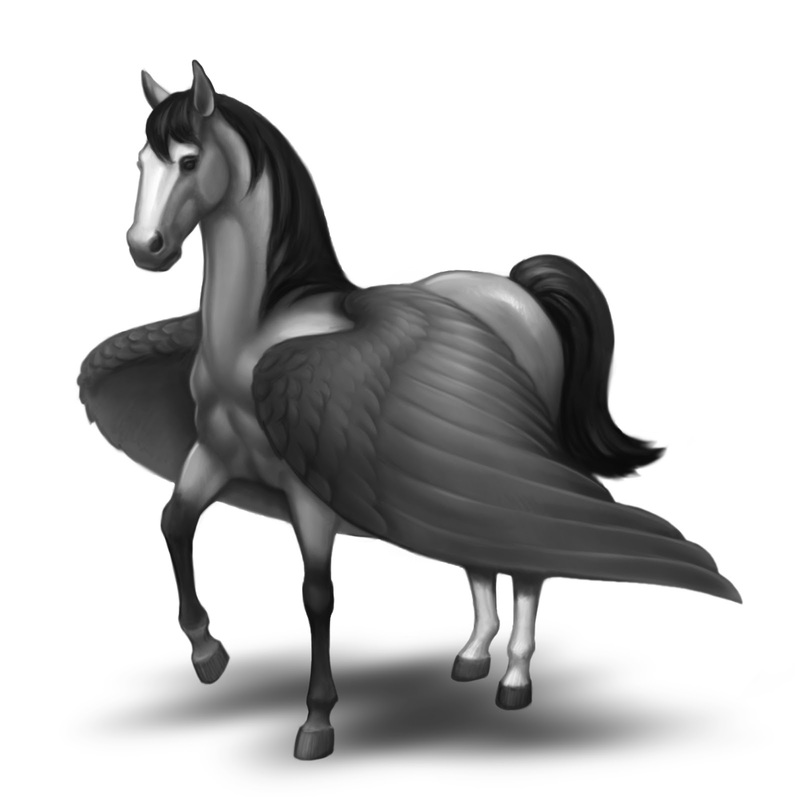 Your character Hazelwind is often compared to his powerful sire, Thundersky. Can we assume from this that Hazelwind will one day become a great leader? Hazelwind (snorts): I don’t know about that, but my character certainly has the potential. He’s honorable and tough, like his sire was, but I think Hazelwind is more thoughtful. You can’t be around Star for long without second-guessing everything you thought you knew to be true. And I think Hazelwind is a stallion that pegasi would follow, but he wouldn’t be a leader like Thundersky was. He’d probably employ a council of advisors, more like Star. MGM: Yes, that makes sense and there are so many pegasi to choose from. Can you tell your fans what it’s like working with such a large cast of pegasi characters? Do you all get along? Any practical jokers in the book? Hazelwind: [nickering] That would be Bumblewind—he’s a joker. There’s a scene in LANDFALL where Dewberry has to fling rocks at a pinecone, kind of like target practice. Each time she threw a rock, Bumblewind shook the tree. She got so mad! MGM: [laughs] I wouldn’t mess with Dewberry. Hazelwind: That’s smart, she’s a tough mare, but to answer your question, we all get along really well. We’ve adventured through three books together and now a fourth. We’ve been through it all, you know, sadness and loss and triumphs too. It’s bonded us as a herd, which is exactly what the book series is about—uniting to solve problems instead of fighting to force solutions. I think we exemplify Star’s ideal guardian herd—most days. MGM: I know you can’t reveal this, but readers want to know if Star and Morningleaf end up together. Can you comment on their relationship? Hazelwind: She’s my sister, so no. I won’t comment other than to say, she’s very, very young. And so is Star. MGM: Hmm, okay. Another thing readers want to know is what was it like training with the United Army and then battling against the Ice Warriors and Frostfire’s Black Army in book #3? Were those chapters tough on the characters? Hazelwind: Warrior training was awesome! I learned so much from the steeds in the other herds. Bringing all of our talents together made each of us stronger. I got in great shape too. But the battle scenes, those are never easy. They’re grueling and frightening, to be honest, but worth it because we were battling to preserve freedom for all pegasi. It was an honor to serve in those scenes. MGM: But at the end of LANDFALL, Nightwing appears to prevail. How did that feel? Hazelwind: (pauses) I’m still sick about it. MGM: I can see how much the series means to you, Hazelwind. Hazelwind: Yeah, it’s not just a book series, you know. Not to me. MGM: Perhaps now would be a good time for your announcement? Hazelwind: Sure! I’m happy to say that the pegasi’s adventures will continue with a new trilogy called THE GUARDIAN HERD: DARK WATER TRIALS, beginning Fall of 2017. These three books will follow some existing characters across the sea to a foreign land. There they will encounter new creatures, new dangers, and new friends too. MGM: Can you tell us who the existing characters are? Hazelwind: Not yet, but a few of them will be very familiar to readers. MGM: And what sort of new creatures will the pegasi encounter in this foreign land? Hazelwind: Drooling dragons, fighting scarabs, hordes of giants, and Landwalkers, to name a few. Hazelwind: Yeah, if that’s what you want to call them. Some pegasi mysteries will also be revealed. We’re all super excited about the new trilogy. The first book is titled PROMISE KEEPER. MGM: Sounds exciting! Well, thank you for joining us today at Middle Grade Mafioso, Hazelwind. We appreciate you taking some time out of the series to answer our questions. Jennifer Lynn Alvarez draws on her lifelong love of horses when writing her books. She lives in Northern California with her husband, children, and more than her fair share of pets. She's pictured here with her beloved mare, Maddie. AND... Don't forget to comment for a chance to win those fabulous prizes. Thank you Hazlewind (and Jennifer!) for visiting us today. Ciao! Donna Galanti is the author of The Element Trilogy (Imajin Books) and The Lightning Road series (Month9Books). She attended an English school housed in a magical castle, where her wild imagination was held back only by her itchy uniform (bowler hat and tie included!). There she fell in love with the worlds of C.S. Lewis and Roald Dahl, and wrote her first fantasy about Dodo birds, wizards, and a flying ship. She’s lived in other exotic locations, including Hawaii where she served as a U.S. Navy photographer. She lives with her family and two crazy cats in an old farmhouse, and dreams of returning one day to a castle. Donna is a contributing editor for International Thriller Writers the Big Thrill magazine, and blogs with other middle grade authors at Project Middle Grade Mayhem. You can find her at www.donnagalanti.com. On her eleventh birthday, Charlie receives a key to go back in time. 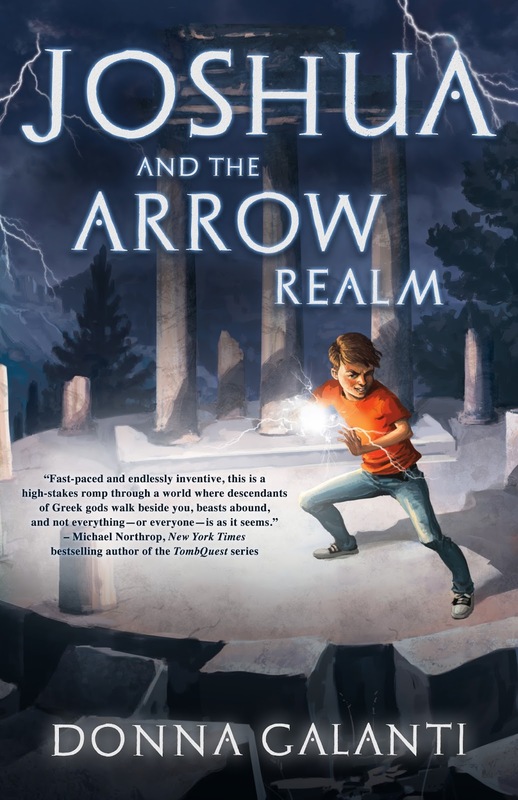 But before she blows out her candles, she rolls her wheelchair right into Ancient Greece with her best friend Maria and her former best friend Trent. She’s a Clockbreaker on an action-packed adventure with a mission: to save her father, and perhaps even save the world. I'd snap that off the shelves in a heartbeat. (That minotaur's stare sends shivers down my spine!) 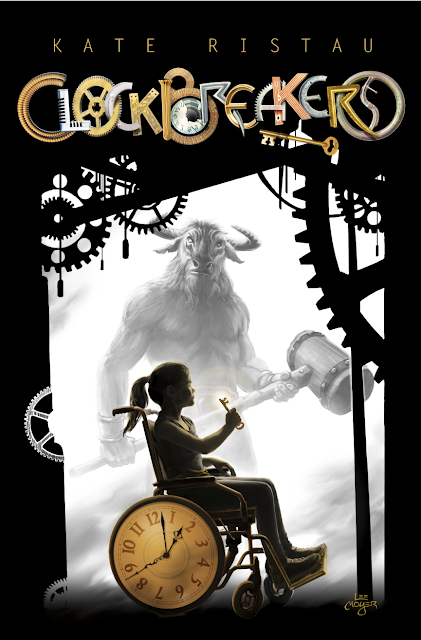 CLOCKBREAKERS release date is October the 1st from Indigo Sea Press. If you'd like to read an excerpt, Kate Ristau has one on her website. Thanks, Kate, for giving Middle Grade Mafioso the honor of revealing this great cover. We look forward to reading CLOCKBREAKERS. 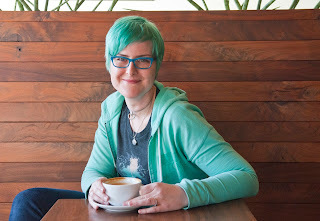 Kate Ristau is a folklorist and an author. 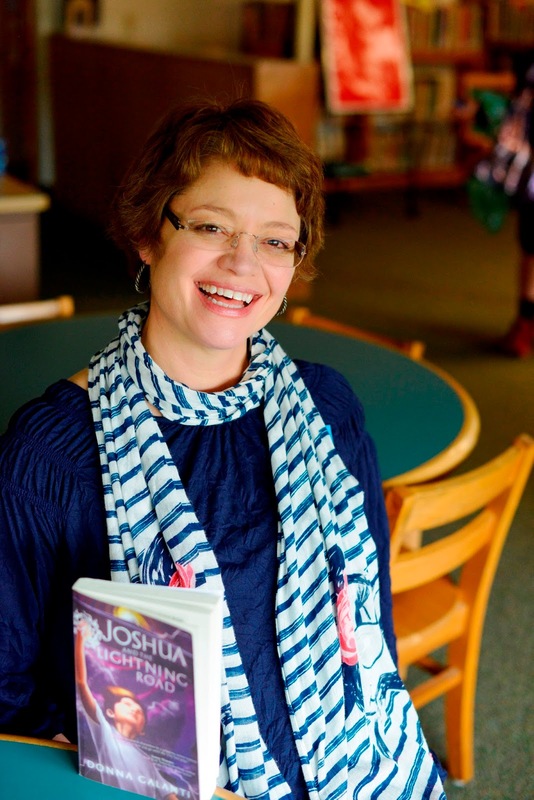 After working for AmeriCorps, she moved to Oregon, where she completed her Masters Degree in folklore at the University of Oregon, where she also taught. 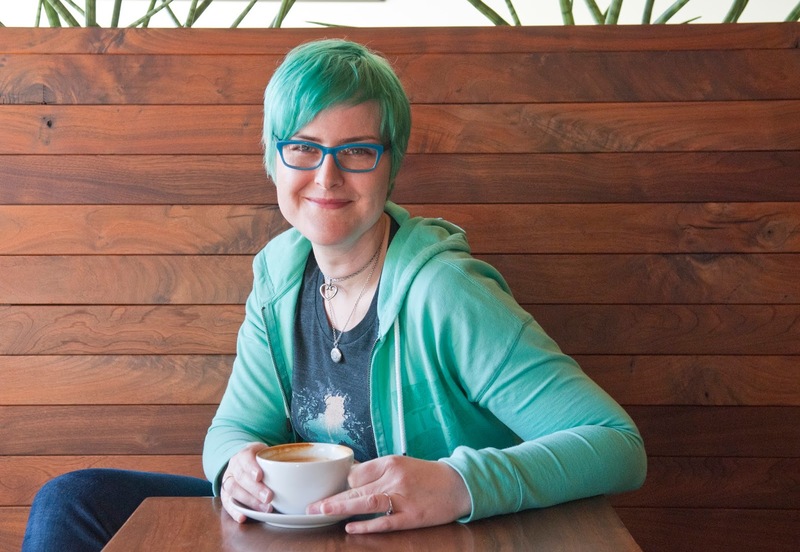 She is the author of Commas: An Irreverent Primer, a grammar handbook co-written with her fellow professor, Maren Bradley Anderson. Anderson and Ristau also edited an anthology of poems, essays, and short stories titled Coarse Grounds: A Coffee Anthology. Her first novel, Shadowgirl, was released by Lycaon Press in May of 2015. Her second novel, Clockbreakers, will be released on October 1st by Indigo Sea Press. Kate also spends a lot of her time with Willamette Writers, where she is the Communications Director. She lives in Portland, Oregon, with her husband, her son and her dog. Lee Moyer served as Art Director for Electronic Arts, Concept Lead for Hasbro, and collaborated with many best-selling-authors for his trilogy of Literary Pin-Up Calendars. He co-created and was lead designer of games Sanctum, Star Chamber, and 13th Age. His board game, with Keith Baker and Paul Komoda, The Doom That Came to Atlantic City was published by Cryptozoic in 2014. He paints more than a dozen posters for film, theatre, and musical events annually. He spent an hour every day for a year painting his series Small Gods. Lee lives in Portland, Oregon and travels widely for work, gallery shows, teaching and lecturing.